School Calls Contact Form Database Systems Corp. Database Systems Corp. (DSC) is a leading provider of contact management and computer telephony integration solutions including voice broadcasting systems, interactive voice response systems, and customer relationship management software and phone systems. For immediate contact, please call us at our Phoenix headquarters at 602-265-5968. Our office hours there are 8:00AM to 5:00PM Mountain Standard Time. We will provide you with any additional information you may require including a price quotation. DSC now provides an online signup for both non-profit and business organizations wishing to use our voice broadcasting outsourcing services. Signup is easy and can be accomplished in just minutes. Our competitive rates are affordable, even for the smallest calling campaign. Start Calling In Just Minutes!. Using our new online signup lets you get started immediately with your calling campaign. Simply create an account and agree to our standard terms and conditions. Then download your list of phone numbers and record a message. We accept major credit cards and for as little as $25, you can begin calling. Its that simple! Both emergency and non-emergency voice broadcasting services can be provided by DSC. To register online, click on the the online registration image or button on the right. 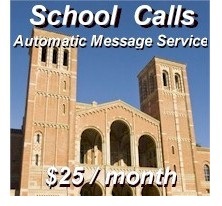 School-Calls.com is Trademarked by Database Systems Corp.